Greater Lawrence Sanitary District (GLSD) serves the Massachusetts member communities of Lawrence, Methuen, Andover, North Andover and Dracut, as well as Salem, N.H. 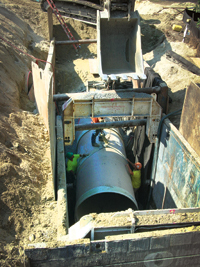 The GLSD was established by Chapter 750 of the Massachusetts Acts of 1968 for the purpose of building, maintaining and operating a system of sewage collection and disposal. The establishment occurred after a series of investigations called for the cleaning up the Merrimack River which had been plagued by pollution, not only from sanitary sewage but also from industrial contributors dating back to the late 1800s. GLSD’s most recent challenge has been to determine the best course of action to repair or replace an existing PCCP force main that was installed in the mid 1970s. The prestressed concrete cylinder pipe (PCCP) was manufactured with reinforcing wire, which was brittle and was leading to pipe failures. Studies included condition assessment and structural evaluation of the PCCP and acoustic monitoring for real-time recording of wire breaks. GLSD learned in 2002 that the pipe supplied in 1974 was similar to pipeline that was experiencing a high rate of catastrophic failures throughout the U.S. The district began an assessment program to determine the structural condition of the line. Through this evaluation, one pipe section was found to be in a state of imminent failure and required emergency repairs to avert a catastrophic failure that would have significant financial and environmental implications. GLSD ultimately chose to replace the existing pipeline as part of its combined sewer overflow control. GLSD’s design considerations for the new line were both long range and mindful of the short-term effects of construction. The district wanted to meet the increase in wet weather flows of 167 million gal per day, select a replacement line that would last for many years, and reduce the disruption during construction by limiting bypass pumping and minimizing the effect of construction on Riverview Street. Two possible options were evaluated. The first was to slipline the existing force main with a 54-in.-diameter pipe and install an adjacent 54-in.-diameter line. Although this option provided the district with 95% redundancy of flow and operational flexibility, it also had drawbacks. The capital, operational and maintenance costs were greater by 15%, and the construction duration would be lengthened. The second option was to install a new 72-in. line capable of handling all of the flows. It was this second option that would prove to be ideal for this project. Several materials were evaluated for the project, including PCCP, steel, ductile iron, high-density polyethylene and fiberglass. The materials were evaluated based on several criteria, including availability, resistance to scour and corrosion, suitability for trenchless installation, and fabrication time and cost. After a thorough evaluation, it was decided that Hobas Pipe USA would be the material supplier on the project. 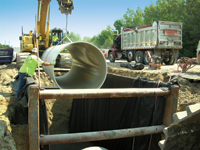 A centrifugally-cast fiberglass reinforced polymer mortar (CCFRPM) pipe was chosen. The company supplied 2,300 ln ft of 72-in.-diameter CCFRPM pipe to the project, which ranged in depth from 3 to 18 ft and included a rail crossing at 17 ft of cover under a Massachusetts Bay Transit Authority line. Hobas also custom manufactured a dozen 1- and 2-miter elbows that connected to the mainline with the standard couplings. In addition to the depth and traffic crossings, the project presented other challenges, including its location in a residential area, the proximity to other utilities, and the need to maintain the pump station and force main without bypass pumping. The specifications also required pressure testing of each pipe joint (low-pressure air) and a system hydrostatic test before the line could be placed in service. In the end, the challenges all were met. Kimberly Paggioli is vice president of marketing & quality control for Hobas Pipe USA. Paggioli can be reached at [email protected].